Sensationalist stories about China’s supposed looming economic collapse captivate international headlines. While these articles might be entertaining to read or talk about, they nevertheless perpetuate an inaccurate picture of an evolving Chinese economy. The really big China story is perhaps too mundane for editors looking for catchy headlines. That is, the emergence of the largest middle-class in the world- beginning with Deng Xiaoping’s reform and opening up in 1978 and still being written today. Upon my own arrival to China nearly five years ago, it became clear fairly quick that the younger generations living in urban areas would not be content to continue working in low-wage factories and construction sites forever. Following a similar arc of modernization and urbanization that developed countries went through in the past, albeit at a much accelerated rate, China ambitiously aims to move up the value chain economically. This development is not easily grasped for those who haven’t had the opportunity to invest significant time interacting with people on the ground in China. 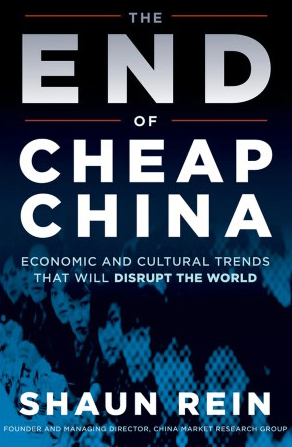 Luckily we have Shaun Rein and his book The End of Cheap China to tell us the story of China’s evolving trends. The book was released in 2012, but the predictions Rein makes are perhaps even more relevant today than when it originally came out two years ago. Rein, a consultant to foreign businesses looking to succeed in the China market, is a polarizing figure among the “China Watcher” community. His critics (mostly other expatriates in China) see him as an opportunist, shamelessly networking with high-level government officials and business leaders, and presenting a naively optimistic view of China’s future. Yet it would be a mistake to suggest that Rein is in denial of the tremendous challenges facing the country. Rather, his position is based on rigorous observation and analysis of the changing values of China’s upwardly mobile population. The End of Cheap China is anything but naive, interweaving Rein’s anecdotes of personal interactions with statistics and case studies. Rein has been in China long enough to see beyond the physical changes to observe social shifts and how they impact individuals. In a chapter titled “The Modern Chinese Woman” he tells the story of an acquaintance he made while living in the northern port city of Tianjin. “Amy”, who Rein originally met in 1997, was a bashful young waitress at a local cafe, working hard and keeping her head down. When Rein returned to Tianjin more than a decade later and ran into Amy, he found a confident, stylish woman complete with a designer bag and trendy clothes. After catching up with her, he learned she had left her waitressing job and had been working for several multi-national companies doing business in the city. Her prospects turned out to be so good in fact, she expressed interest in becoming an entrepreneur and starting her own business. Opportunities like this abound for young and savvy Chinese urbanites. Competition is fierce in China’s cities, but compared with the chaos that ensnared the country during most of the 20th Century, there has never been a better time to be a young person in China. “Real estate is intentionally ramshackle. Many Westerners say Chinese real estate companies exhibit poor urban planning. A common complaint by visiting Westerners is that malls are not built attractively, or that parking lots are built on prime building locations, like on a riverside, while shopping complexes and restaurant zones are built across the street without good river views. This sober explanation of China’s real estate industry is not something you’re likely to read in the pages of the New York Times or one of the countless alarmist articles about China’s “ghost cities”. Rein goes on to debunk the popular opinion by perennial China bears such as economist Nouriel Roubini and hedge fund manager James Chanos that the country has over-leveraged itself on infrastructure development. The book’s chapter on real estate does acknowledge some problems within the industry, including the lack of quality management in new commercial developments, which may cause some developers to fail. As a matter of fact, this is already happening in some cases, yet Rein points out that because commercial real estate only accounts for 20% of new construction, any serious problems in this sector are unlikely to have a catastrophic impact on the overall economy. The underlying message throughout the book is a warning to foreign businesses to not assume that China will always just be a “cheap place to manufacture things”. On the contrary, it is important at this stage of economic development for savvy investors to seize the opportunity in selling to the rapidly growing Chinese consumer class. Granted, many foreign businesses have already seen this opportunity, but Rein warns of the competition from domestic Chinese firms such as Haier (in the home appliances market) and Tencent (in the social media space) who are developing strong brand awareness and consumer trust within the local market. Perhaps it is fitting that this review end with a mention of successful home-grown Chinese brands as Rein recently announced a follow up book coming out in November of this year titled “The End of Copycat China“. Up until this point, Chinese companies have been seen by the international community as ‘copycat artists’ stifled by a controlling government and an inability to think creatively. Holding onto this view going forward is dangerous, not only for investors involved in China but for global brands competing for market share internationally. Rein’s new book is bound to be insightful and timely. In the meantime, if you haven’t already, I highly recommend The End of Cheap China as an excellent guide to understanding the current state of economic development in The Middle Kingdom.